Intimidated by the idea of pulling together a seafood paella? 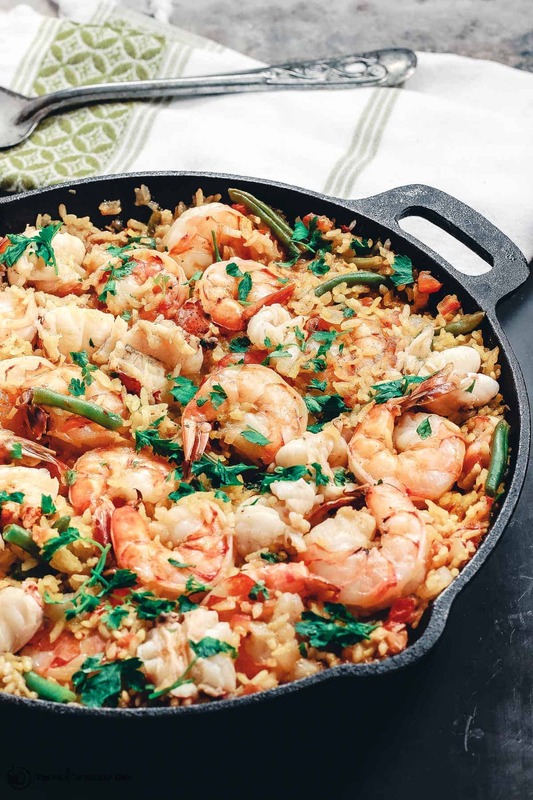 This easy seafood paella is a modern take on traditional paella that requires fewer ingredients and no special pan. But it will deliver the WOW factor on all levels! Be sure to check out the video and step-by-step tutorial for this foolproof seafood paella recipe. So, historically, paella was introduced as the delicious solution to leftovers. And depending on where you live, you would utilize ingredients available in that region. And that’s why, it makes perfect sense that there are many variations of paella today! I take comfort in that paella is one dish I can make my own! I chose shrimp and lobster for my star seafood ingredients, but kept things simple otherwise. And no need for a special paella pan, a cast iron skillet will work! 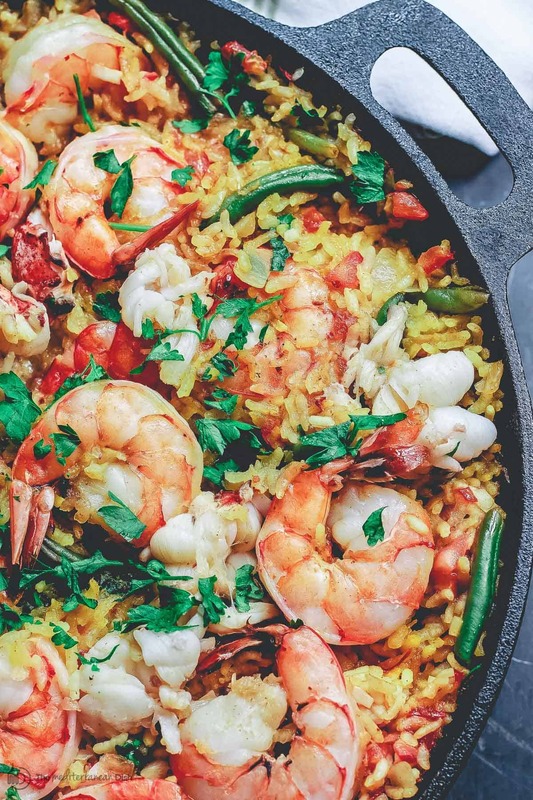 Even as we get creative with paella, there are two constants in a good paella recipe: Spanish saffron–thankfully, we need a little bit of this expensive stuff– and short-grain rice or Calasparra rice. 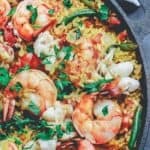 How to Make this Easy Seafood Paella? 1- The first step here is to get the lobster cooking in boiling water. This will be quick, about 1 to 2 minutes. You don’t want to overcook the lobster, but you’re looking for it to turn a nice pink. 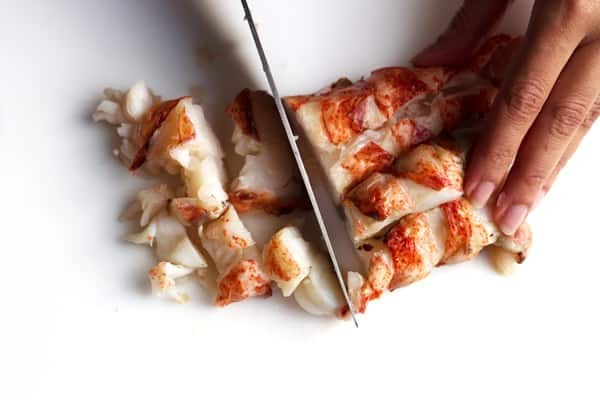 When the lobster is cool enough to handle, remove the shell and cut into large chunks to use later. And keep the lobster water for later use! 2. I like to soak the paella rice in water a few minutes before using (this helps it cook evenly). Then to begin making the paella, heat 3 tbsp EVOO over medium-high (making sure it’s shimmering but not smoking.) Saute chopped onions first for a couple minutes, then add the rice (drain first). Cook the rice for 3 minutes, stirring regularly. Yes, I am aware that in some recipes you are almost “forbidden” from stirring the rice. But it worked best for me this way. Grateful to Bobby Flay for this tip. 3- Now we add a few more ingredients: garlic and the lobster cooking water first. Then the saffron and it’s soaking liquid along with spices, paprika, cayenne pepper, aleppo pepper, and salt. Stir in the chopped tomato and green beans. Bring to a boil and let the liquid reduce, then cover (with lid or tightly with foil) and cook on low heat for 20 minutes. 4- Now, we add the shrimp over the rice, pushing it into the rice a little. At this point, if the rice looks to be too dry and might need a tiny bit of water, you can carefully add some. Cover and cook for another 10-15 minutes until the shrimp turns pink. Finally, add the cooked lobster chunks. When the lobster is warmed through, turn heat off. Garnish with parsley, if you like. I really can’t claim to know what the traditional way to serve paella is, but in my house, we serve it family style with a favorite white wine. 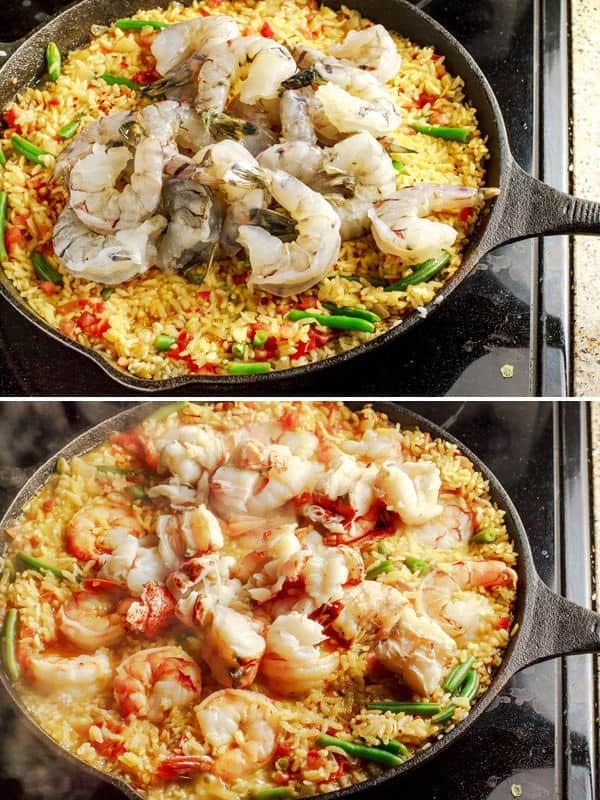 Easy seafood paella recipe with lobster and shrimp. Be sure to see the tips for best results. Watch the video and step-by-step tutorial above. Pro-Tip: Depending on the kind of rice you use, you may or not need to soak it in water before cooking. I have found that soaking rice in water for 15 minutes or so (until you are able to easily break a grain of rice between your thumb and index finger) helps speed the cooking process. When you do this, you naturally use less cooking water. The rice cooks evenly and more quickly. 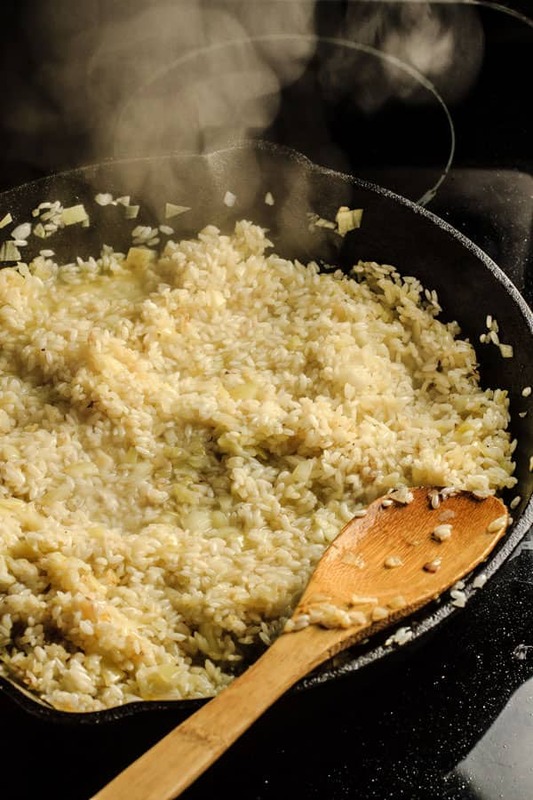 Note: In some paella recipes, you are almost “forbidden” from stirring the rice early in the cooking process. But it worked best for me this way. Grateful to Bobby Flay for this tip. SAVE! 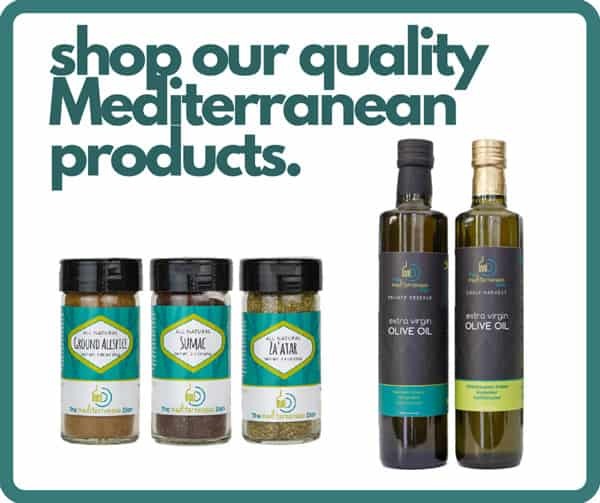 Try our Our Greek Olive Oil Bundle; Ultimate Mediterranean Spice Bundle; or create your own 6-pack or 3-pack of our all-natural or organic spices! Hi Suzy!! Ayna and myself decided to try this recipe out (we’re not much chefs at heart!) and the instructions were simple and to-the-point for a 1-star ‘chef’ like myself! Are there any allergies that are common in a dish like this? I’d like to surprise my family with this but don’t want to give too much information on what I’m cooking. Funny story, the reason I decided to make this was because I found lobster on sale at my nearby grocery store and figured I be risky and stay clear of imitation crab for the night 🦀. Are household animals naturally allergic to any of these ingredients as well? Thanks a million Suzy and keep hustling! I love your recipes and have purchased the spices and olive oil you have so I can cook them. I like to print recipes so I can follow along as I prepare them. I now have the ingredients but no longer have any of your recipes but the ones you made available when I joined and sent you my Email address. Did you publish a book? Hi Phillis, thank you very much. I do not have a cookbook in print yet, but hopefully in the future. However, all the recipes are available here for free to all readers. Here is the link to browse recipes by category: https://www.themediterraneandish.com/recipes/ Enjoy! Looking forward to trying this!!!! If I’m using chorizo, when would you recommend cooking it/adding it to the dish? Hey, Taylor. 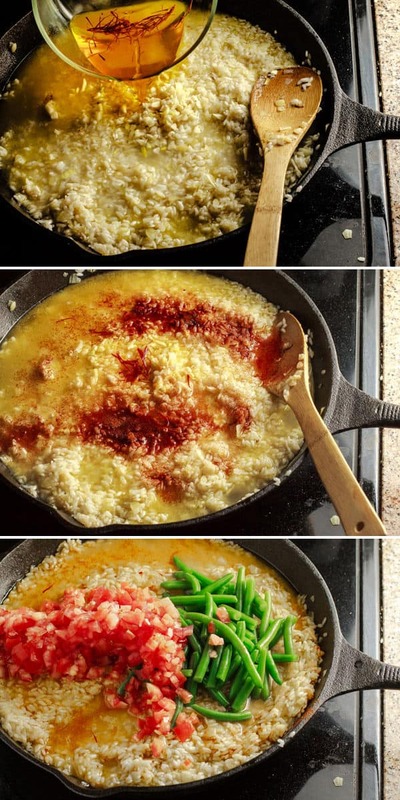 Great question, you can cook the chorizo first and then add it in when you add the rice. Enjoy! Hey Suzy, I was wondering, I’ve read that squid ink is slightly salty, so was hoping to replace the salt with that since that’s one variant the Spanish would make. Would that work with your recipe? Also, I’d like to have more variety of seafood since my wife loves seafood, so was hoping to make it with lobster, shrimp, bay scallops (since I have some left over from a previous dish I made, I prefer sea scallops), mussels, squid, and maybe some clams, but maybe that’ll be too many things. How do you think it is best to prepare the other items not mentioned in your recipe? Should I cook them separately or add them to the dish at certain times? Ken, your variations would work! This is super simplified recipe with fewer items. But adding a couple more would not hurt. You can sear scallops, for example, and add them in when you add the shrimp. I’ve looked through a couple recipes as far as muscles or clams, adding say 6 or so of each, some would scrub them real well and simply nestle them into the rice earlier and let them cook with the rice and its liquid. Hope this helps. I used all jumbo shrimp and made a ‘shrimp shell’ stock in lieu of the lobster water – sauteed shells and added them to the water I slightly pre-cooked the shrimp in. Brought back to a boil and used as the ‘water’. That way I could also pre-flavor the shrimp with a bit of ‘shrimp boil’ liquid for more depth. Turned out to be a phenom crowd pleaser!! Thx Much!! Hello, Hugo! Sure, I think you can easily use fish stock here. Enjoy! You can also use the shrimp shells to make a stock, just boil them in water. I am also in Japan. I cooked this tonight instead of lobster I used snow crab legs, and broccoli instead of string beans, I also added some green, yellow and orange peppers to add more color. Happy cooking! Awesome meal! I never knew it could be so easy. Thank you! Hi love the recipe. It seems easy enough for me to try it. This is a great recipe, but where is the link to the video please? Easy Seafood Paella. Hi Pam! The video should appear on the page now; we were experiencing a glitch which is now fixed. Enjoy. I went on Google and looked the recipe on that. The video was on this site above the recipe. Awesome, Tony! Glad to hear it! I used to make it a while back, it’s so quick and easy to prepare, think I must make it again. I use basmati rice and peas. Love it thanks for reminding me. I have some scallops at home. When would be a good time to add to the paella? This will be my first time cooking paella and scallops! You can add them with the shrimp, they’ll need about 10 minutes or so to cook depending on their size. Very easy to follow and enjoyed by all, thank you. So glad to hear it! Thanks so much for the feedback! I want to do a Paella for Eid on Friday and I came across your recipe which looks delicious and easy to make. Can I cook it in my electric frying pan? because don’t have a wide enough pan or skillet. HI Zaida! Happy Eid! I wish I had an answer for you, I have never made Paella in an electric frying pan, so I am not sure I can give you good advice on that. Thanks Suzy and thanks for your reply, much appreciated! I’ll give it a try by cooking the paella in the frying pan and I’ll give you feedback ? Sure, Diane! That should work fine! Enjoy! Remarkable sharing with my two sons who will love this with fresh lobster in the West Indies. Thank you, Barbara! I hope they enjoy it! Happy 4th! What can I use in place of saffron threads and the aloppa pepper flakes as I don’t know if can find around here? In place of Alleppo pepper, you can mix cayenne with sweet paprika…not exactly the same, but will give similar depth. There really is no substitute for saffron, particularly in paella dishes. But if you use a very little turmeric, you’ll get a bit a yellowish colored rice…it will not taste the same…and would not be considered Paella, but still a great rice dish, in my opinion.